Save 225 miles, Jerod Haase’s career in basketball has nearly come full circle. That’s the distance between Haase’s childhood home in South Lake Tahoe—where he shoveled snow off a blacktop to put up shots—and the palm-lined boulevards of Palo Alto, where Stanford University officials named Haase, 42, their head basketball coach on March 25. Haase starred memorably as a guard for South Tahoe High School (STHS), where in 1992 he led the program to its second Nevada state basketball championship over the much larger Clark County–based Western High School in the AAA title game. He would go on to split his college career between the University of California, Berkeley, and Kansas University (KU), where he served as a co-captain during his 1996–97 senior season before co-authoring Floor Burns, a book about the season, later in 1997. Haase would later work for 13 years as a top assistant to Roy Williams—his coach during his time at Kansas—at both KU and, later, North Carolina. In 2012 he took his first job as a head coach at the University of Alabama, Birmingham (UAB), leading the Blazers to a memorable upset of No. 3 seed Iowa State University in the second round of the 2015 NCAA Tournament. Over his four years at UAB, Haase took a team that was 7-9 in Conference USA play during each of his first two seasons to a team that was 28-8 over the final two years. Stanford came calling in March and Haase now runs his first big-time program in the prestigious Pac 12 Conference. Though decades have passed since his days as a Viking at STHS, Haase’s experiences growing up in Tahoe remain with him. The youngest of Carol and the late Gary Haase’s five children—who would all go on to success as college athletes—Haase recalls a childhood filled with days on the family’s backyard basketball court. That desire put Haase on STHS varsity head coach Tom Orlich’s team for four straight years beginning in 1988, well before a growth spurt turned a skinny 5-foot-9 kid into a 6-foot-3 scorer big-time colleges salivated over. “He comes from a great family, and they did a great job raising him as they did with all their children,” Orlich, now the head man at Fresno’s Clovis West High School, says. The two speak weekly; Haase credits his own coaching style to Orlich in addition to Williams. Both trace much of Haase’s hard-charging style—a metric for diving for loose balls called floor burns was invented for him at KU—with his formative time at STHS and the 1992 title team. Haase will have to apply those principles to his new job. Stanford is coming off back-to-back mediocre seasons in the Pac 12—the team went 9-9 in 2015 and 8-10 in 2016 inside the conference under former head coach Johnny Dawkins—and hasn’t made a tournament appearance since 2014. 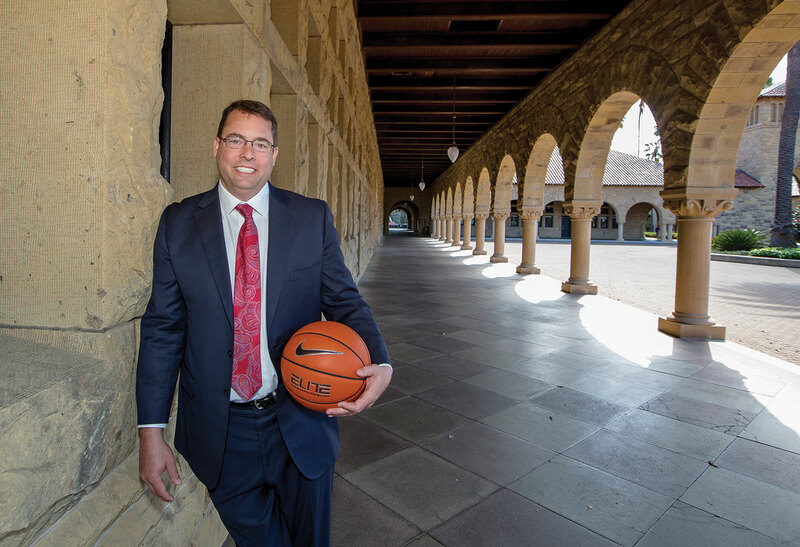 The team hasn’t won the Pac 12 since 2004 (then the Pac 10), and some national pundits question whether Stanford’s stringent academic standards can equate to big-time hoops success, though the school has succeeded in football. If there’s a will—and the kid brother of four college athletes who cleared his own court during a Tahoe winter certainly has will—there’s a way.